The perfume style referred to as “chypre,” was first embodied in Coty’s Chypre de Coty at the beginning of the 20th century. 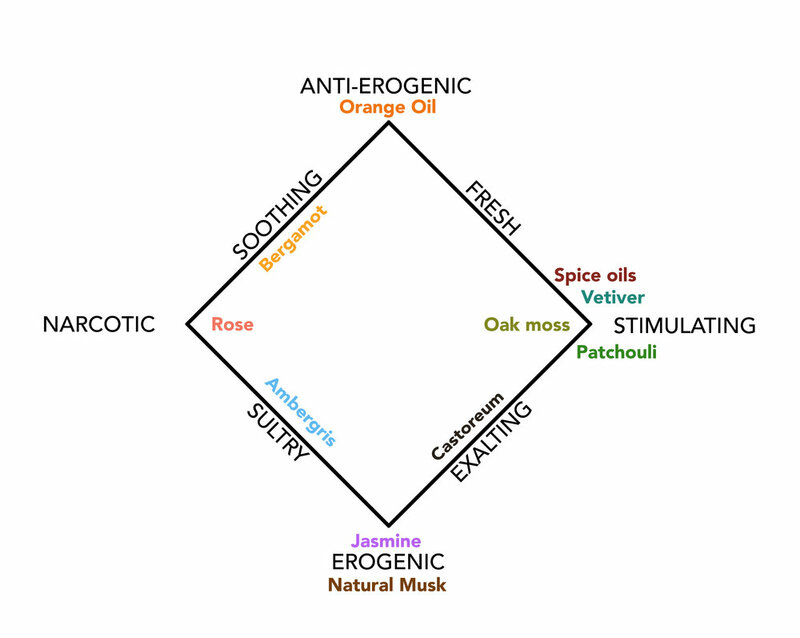 Deconstructing this perfume provides a good illustration of how to use the Odor Effects Diagram from my last post, which I included again below. I’ve never smelled Chypre de Coty—few people have—but deducing from the materials it contains, I would think it would include mossy, citrus, musky, floral, and spicy notes. It would have notes of authentic civet, ambergris, and musk. It would, of course, contain jasmin. Jasmin absolute is perhaps the most important ingredient in all of perfumery, special because it contains intrinsic contrasts that amplify many perfumes and perfume ingredients. Jasmine contains jasmone which, to me, is slightly woody with an apricot aspect. In any case, it is considered stimulating. Indole is a strange off-putting aroma found in feces that the plant uses to attract insects. It is highly erogenous. Jasmone and indole create an exalting tension between the stimulating and the erogenous corners of the diagram. Jasmine is also sultry because it contains narcotic materials such as methyl anthranilate and benzyl acetate, which form a line to the erogenous indole, natural musk (artificial musks are considered narcotic), and ambergris. These last two are added to augment the erogenic nature of the perfume. To heighten the stimulant effect, Coty includes oakmoss, which reinforces the exalting quality of the perfume. He also includes spices, vetiver, and patchouli to enhance the stimulating effect of the oakmoss. Coty also used a large amount of bergamot for Chypre de Coty. It’s an anti-erogenic citrus fruit as it contains terpenes, along with lynalyl acetate and linalool—both narcotic. This creates a line between anti-erogenic and narcotic that produces a soothing effect. Notice how these two lines that Coty forms—soothing and exalting—are in opposite positions. These complexes, both inherent in the flower, contribute to jasmin’s usefulness as a perfume material.